The winner is Jason Pace from Flowood, MS. Very cool Part Five mask! I've sent you a message and your posters will be out shortly! I can't believe this will be the last "Halloween Sightings" for 2013. This year, especially this month, has been huge for my website and I want to thank everyone who took the time to not only visit this page, but also support it by commenting, entering contests, and liking our facebook page. Prior to visiting the Austin area I'd never heard of "H-E-B," we decided to venture into one on Sunday and were a bit overwhelmed. We were expecting a small grocery store, what we got was a department store that rivaled Walmart. It was big. Their Halloween items were clearly picked over, but they still had some cool stuff left. Sunday afternoon we packed our bags and checked out of our hotel. The last day of a vacation is always a weird one for me. There's that strong feeling of not wanting to leave that's met head on with the longing for the familiarity of home. Thankfully the urge to stay was lessened knowing I had the Bagdad Cemetery to look forward to. That's weird I guess, looking forward to a cemetery. The Texas Chain Saw Massacre is one of my favorite films, with the cemetery just 20 minutes away from the Hotel, a trip to the small town of Leander was inevitable. Have you ever felt out of place at your local natural history museum? Ever wish there was a museum that better catered to a sick and twisted individual like yourself? Good news, your home-away-from-home can be found in Austin just off of the famous 6th street! Alright folks I've saved the best for last! If there's one DST UM figure to purchase this year, it's this one. Dr. Jekyll sports Diamond's best likeness yet, when you toss in the lab equipment you've got the makings of something pretty darn cool. Abbott and Costello meet Dr. Jekyll and Mr. Hyde might not be on your radar for Halloween viewing tomorrow, but after purchasing this figure it will definitely be on mine. 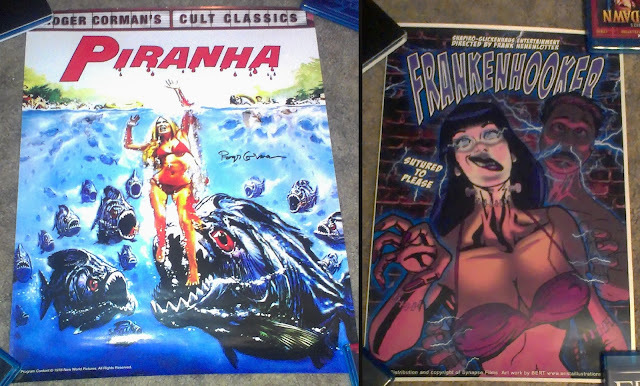 Head on over to Cannibal Review's official facebook page for a chance to win two awesome posters! Did I mention the Piranha poster was signed by Roger Corman!? The contest ends at 11:59 on October 30th with a winner announced on the 31st. The contest is eligible to those who are fan's of the page. All you have to do is comment on the contest post with a picture of you in your Halloween costume, it can be a new picture but (for nostalgia's sake) older ones are perfected. I'll kick it off, here's two from your's truly. If I had to guess I'd say these are from 1992 and 1993. The contest ends in less than a week so be sure to get on over the the Facebook page and enter! Re-Animator (1985): What can I possibly say about this film that hasn't already been said hundreds of times? Re-Animator is a quintessential 80's horror flick. It's very tongue and cheek (head giving head, anyone?) 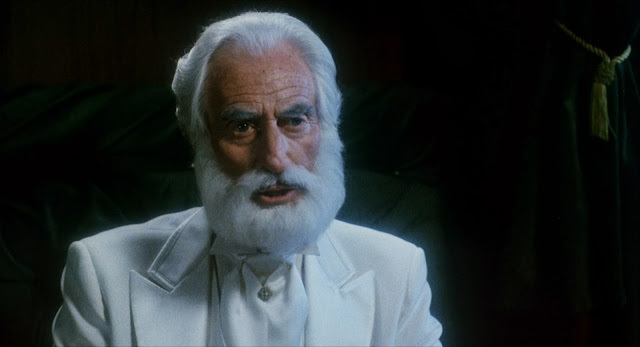 and contains some great performances from Jeffery Combs (Herbert West,) Barbara Crampton (Megan Halsey,) and David Gale (Dr. Hill.) The film has had two sequels (with a third stuck in developmental hell,) but they all really pale in comparison to the 1985 film. There's a serial killer on the loose! He's not your average serial killer either, this guy (Franklin; John Jarratt) likes to keep the heads of his victims in jars... Looking back at that statement maybe keeping heads in jars is average serial killer behavior. Never the less, he suffers from serious control issues and is posing a major threat if you're a pretty and vulnerable female. Luckily for you Detective Delgado (Casper Van Dien) is on the case. Quit snickering, I know exactly what you're thinking...."Casper Van Dien!?" 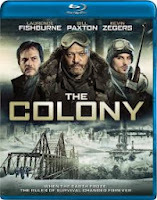 Yes, Casper Van Dien, that name might not give you much confidence when it scrolls across your TV screen, but I assure you he was surprisingly good in this movie. Want to win The Conjuring on blu-ray!? Check out these five GIF's then leave a comment telling me which one is your favorite. Yes, it's that easy! Make sure and use your google account when you leave a comment so I have a way of getting in contact with the winner, if you do not have a google account just be sure to leave an email with your comment. 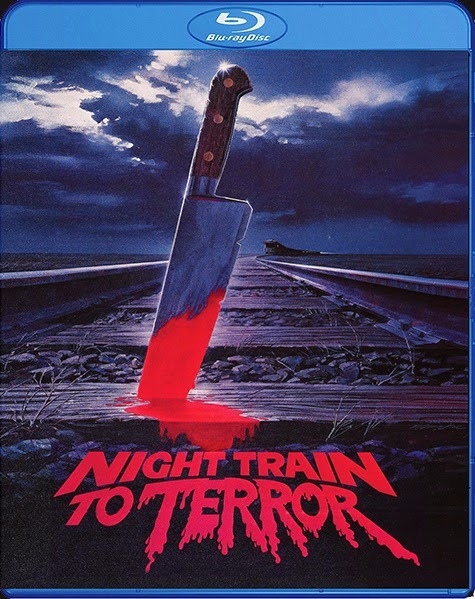 With the month of October in full swing and nearly 70 horror films already under my belt it seems almost blasphemous to switch gears and get into a spaghetti western, but I figured a break between vampire flicks might do me a bit of good. In 1966 Sergio Corbucci's Django set a new standard for the Italian Western, it was violent, it's protagonist was dark and brooding, and it's scope was big. The film was met with much success and eventually would spawn numerous knockoffs and in some cases re-titlings. Actor Franco Nero would be followed by the title for decades, for instance his 1966 film Massacre Time (dir. Lucio Fulci) carried the title of Django - Sein Gesangbuch war der Colt When it was released in Germany. 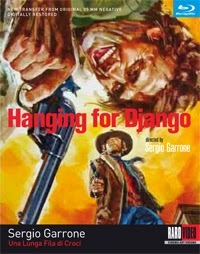 The Django title wasn't just exclusive to the blue-eyed actor, 1969's Hanging For Django has absolutely nothing to do with the character Corbucci created and is lacking Nero's presence. It's one of well over 50 westerns that at some point were re-titled for purely monetary reasons. Looking back, the 90's weren't exactly the best decade for Horror films. Early on we were graced with a few gems, a little over halfway into the decade Scream rippled the waters and kicked off a few awful trends, I feel the 90's ended on a high note however with the insurgence of DVD, home theatres, and a little pile of camp known as Idle Hands. Anton (Devon Sawa) is a lazy high school student who'd rather smoke weed and scratch his junk than attend any classes. He's got a few cool friends (Mick; Seth Green, Pnub; Elden Henson) and a pretty big thing for the girl next door (Molly; Jessica Alba,) though he's too shy to ever converse with her. 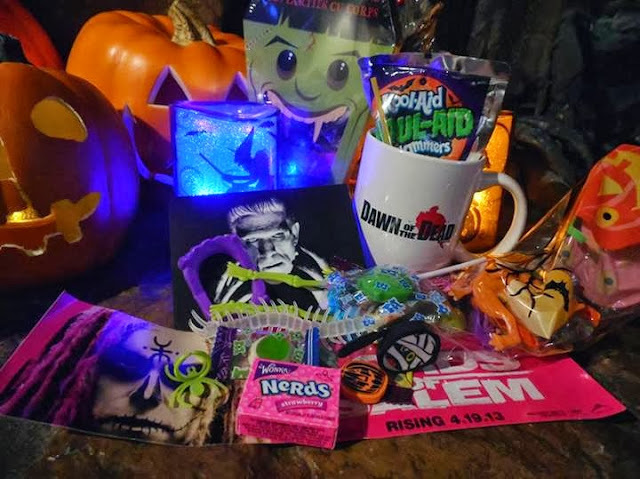 Today we'll be taking a look at DST's newest Universal Monster offerings! The Mole Man and Mr. Hyde are part of the exclusive Toys R Us line and are also accompanied by The Hunchback, though I decided to skip him as I've got the deluxe version. The 80's were a special time for the genre, if you had an idea and knew the right people you could probably get a picture funded. Sure, occasionally you might have to cut a few corners...Maybe the mob funded your film, who knows. It was an "ask questions later" kind of time when companies were more willing to take risks. It's that kind of freedom and attitude that produced some of the genre's most memorable films. 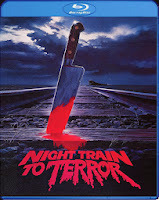 It also gave us films like Night Train to Terror. A movie that will likely leave you scratchin' your noggin. Just a quick reminder! 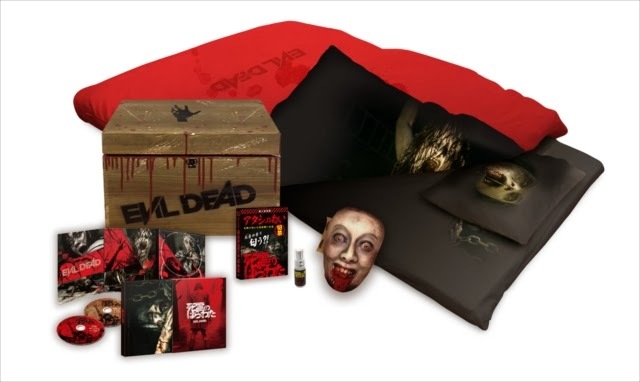 You can enter by liking Cannibal Reviews' facebook page and commenting on the contest post. Pretty easy eh? There will be another contest going up on the page in the next few weeks so be sure to add the page into your interests list so you can be updated! NYCC 2013: Re-Animator goes to Amok Time, Mezco to produce more Chucky items, and more! A bunch of cool news coming out of the New York Comic Con today! Amok Time has picked up the license for not only Re-Animator, but it's 1989 sequel Bride of Re-Animator. Other than Herbert West it wasn't clear what other characters will be produced in plastic form. Fans might remember this amazing prototype that Sota Toys produced a few years back, sadly the release was scrapped and the company went belly up successfully creating a Re-Animator blue-balls epidemic. Thankfully in 2014 Amok Time plans on making things right! 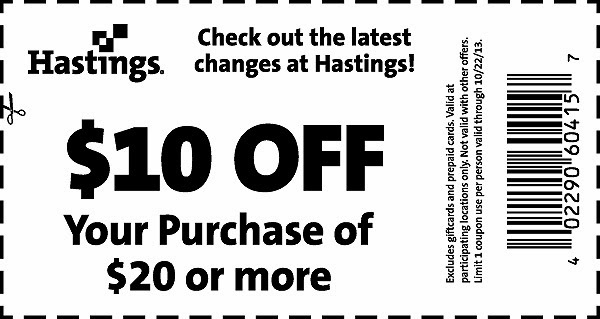 New Hastings coupon can save you some cash this month! October just got a little better. With companies like Criterion, Scream Factory, and Olive Films releasing a number of horror titles this month, fans of the genre might have to tighten their belts a bit. Thankfully my roommate found the above coupon on Hastings entertainment's website. 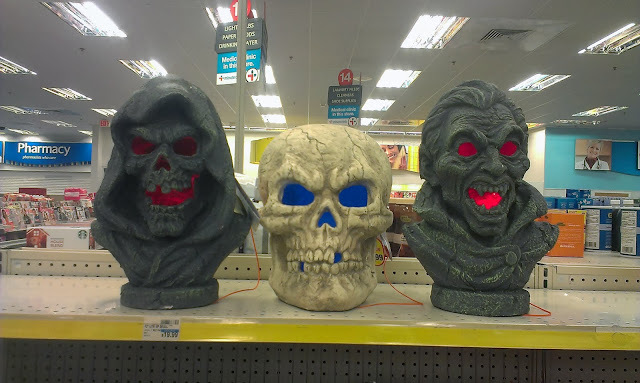 Halloween Sightings: CVS Pharmacy 10/5/2013 and a trip to "The Sanctuary." 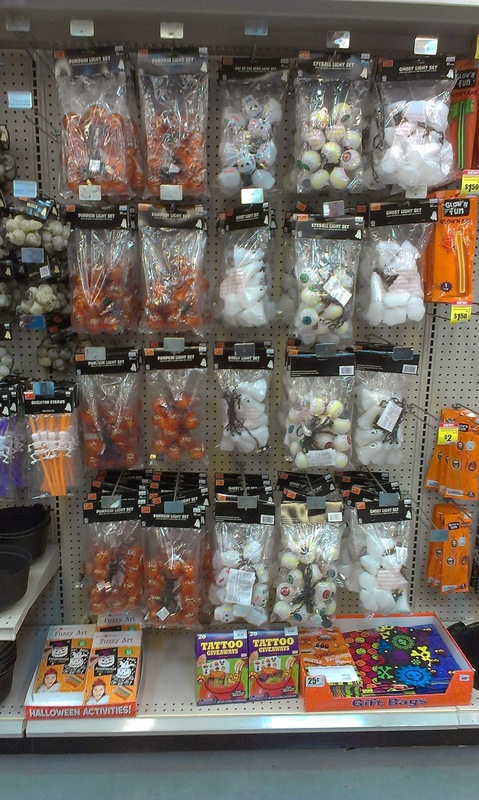 CVS' selection of Halloween goods was pretty small. I really debated on whether or not I should even bother dedicating a post to the store...But man, I really had to spread the word about these. 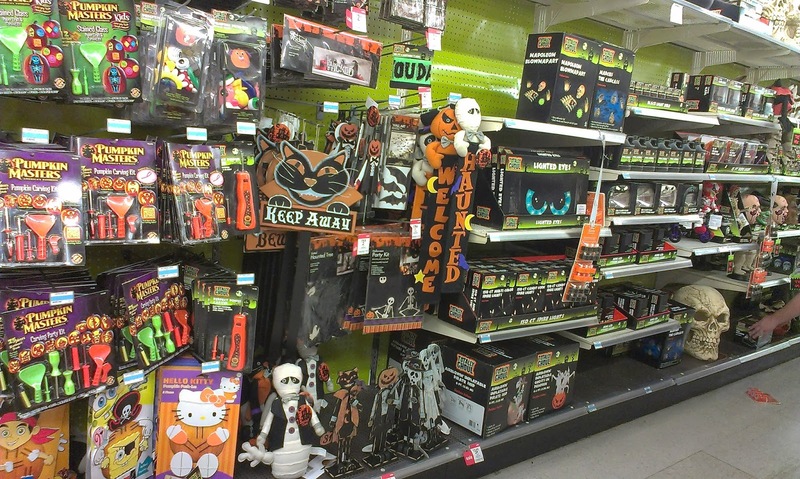 I saw some really great pictures of Kmart's setup thanks to Dinosaur Dracula's post. I figured it was about time to make the trek to the much forgotten about store. Currently there's only one left here in Oklahoma (Shawnee, OK to be exact.) Luckily the small town isn't too horribly far from us. There's no way a film like The Texas Chain Saw Massacre could ever be recreated, director Tobe Hooper knew this when he began working on it's (inevitable) sequel. 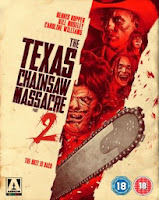 The Texas Chainsaw Massacre 2 isn't just vastly different in terms of characters and settings, but the writing, direction, and tone received overhauls as well. The outcome is a violently satirical, often times hilarious sequel. Considering the bleak nature of the original film, it's easy to understand why some fans tend to stay away from sequel; but if you can get past such a wild change you're in for quite the ride. It's been a bit slow here at Cannibal Reviews, especially considering this is the first week of October. But don't worry kiddos as I've got huge plans for the rest of the month. I'm hoping to get 3 or so reviews up by the end of the week/beginning of next week. I've got even more Halloween-themed posts lined up until then. Best of all contests, I've got two definite contests ready with a third depending on the quickness of USPS. So enough chit-chat, let's get straight into the first contest! Meghan and I are going all out this Halloween, we began assembling Trick 'R Treat bags for all of the kids. I'm a total sucker for those tourist pamphlets that haunt the lobbies of hotels. The big colorful photos and fancy summaries have a way of hypnotically pulling me in. I always manage to come home with a few dozen every time I travel. Like most, I keep them; hoping to eventually visit these various "Alligator Farms" and "Wax Museums" that are scattered around the lower 48...But I know for the most part the closest I'll ever get to these notorious locations is through revisiting these glossy guides the next time I'm trying to find a matching pair of socks. So I figure what better way to kick off October than to make my own. 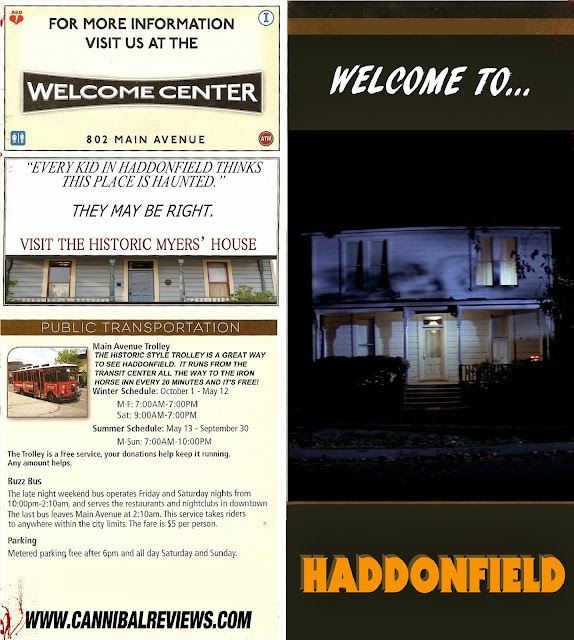 A combination of two things I love: Tacky, advertisement-filled pamphlets and horror movies.